What??! The Stock Market is Rigged??? You may have heard about the 60 Minutes interview with author Michael Lewis, a former Wall Street broker, author of “Liar’s Poker” and “The Big Short,” who has just come out with a new book entitled “Flash Boys.” Lewis is an eloquent and astute critic of Wall Street’s creative and predatory practices, and in his new book (and in the 60 Minutes interview) he offers evidence that the stock market is “rigged” by a cabal of high-frequency traders, abetted by stock exchanges and Wall Street firms. The charge is entirely true. And it is also completely irrelevant to you and anyone else who practices patient investing. Lewis is exposing a secret advantage that a surprisingly large number of professional traders, employed by large brokerage firms, are able to get when they build high-speed fiber optic cable feeds directly into the computers that match buyers and sellers of securities. Some of those traders actually have their trading computers located in the same room as the New York Stock Exchange and Nasdaq servers. And some pay extra for access to more information on who wants to buy and sell, more quickly, than would be available to you if you were sitting down at your home computer looking to buy or sell Apple Computer through a discount brokerage account. All of this is perfectly legal, but Lewis points out that it is also shady. Why should some buyers and sellers have millisecond advantages over others? The companies that see more of the market, more quickly, are able to jump in ahead of you and me and buy stocks at lower intraday prices, and then jump ahead 15 seconds later and sell to the highest bidder before you and I would even see that bid on our screen. They can buy the stock you put in an order for and sell it to you at a fractionally higher price through the normal market-matching mechanisms. This way, they can squeeze out additional pennies and nickels on each transaction, and if they do this thousands of times a day, it adds up to real money–millions of dollars a year. Why is this irrelevant to you? Many of those lost dollars are coming out of the pockets of day traders, ordinary people who are foolish enough to think that they can outwit the markets by moving into and out of individual stocks several times a day, or professional traders at hedge funds who may not have access to the fastest server or a direct feed into the Nasdaq servers. There are tens of thousands of these investors, and many of them, watching the 60 Minutes report, discovered for the first time that they are getting routinely fleeced by Wall Street’s money machine. However, if you’re invested for the long term, it really doesn’t matter how many times the stocks you own inside of a mutual fund or ETF, or directly in your retirement account, change hands or at what price every few minutes. It doesn’t even matter whether your stocks are up or down in any given month or year, so long as the underlying companies are building their value steadily over time. Your time frame is eons compared with the quick-twitch traders, who hope to be in and out of your stock in minutes rather than decades. Your mutual fund that buys when a stock seems cheap might, if it’s careless or unsophisticated, give up fractions of a cent on its purchases, but that likely isn’t going to have a measurable impact on your long-term investment returns. Somehow, this important fact was lost in the 60 Minutes interview. The interview also didn’t mention that things can go horribly wrong in the arcane and predatory world of rapid-fire trading. The Hall of Fame of trading losses includes $9 billion lost in credit default swaps by a single Morgan Stanley trader from 2004 through 2006, or the $7.2 billion lost by Societe Generale trader Jerome Kerviel over a few days in 2008, or the $2 billion “London whale” losses in 2012. They–and many others–used their milliseconds speed advantage to generate staggering losses, proving that even the smartest operators aren’t always raking in the profits. In the end, the interview tells us several things. First, it exposes, yet again, the fact that the Wall Street culture will go to great lengths to grab money out of the hands of unwary investors. One wishes that the 60 Minutes interviewers had asked a simple question: what economic purpose is served by fast-twitch traders, trying to make money for their wirehouse employers by purchasing and selling individual stocks multiple times a day ahead of other investors? Is this benefiting the economy in some way? Second, the interview makes plainly clear the folly of an average investor trying to outsmart the markets with short-term trading activities. And finally, for those who can see the big picture that is never explained in the 60 Minutes interview, these revelations confirm the wisdom of having a long-term investment horizon. When you measure returns over three- to ten-year time horizons, the milliseconds don’t matter. 2 Responses to What??! The Stock Market is Rigged??? 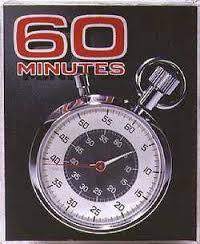 Thanks for the explanation of the 60 Minutes report. I was trying to figure out how this effected me as a long term investor and it is good to know that it does not! Kind of reminds of the story of the race between the tortoise and hare! Good post. I was ‘curious’.